Competition finalist: a ‘pretty in pink’ boudoir! 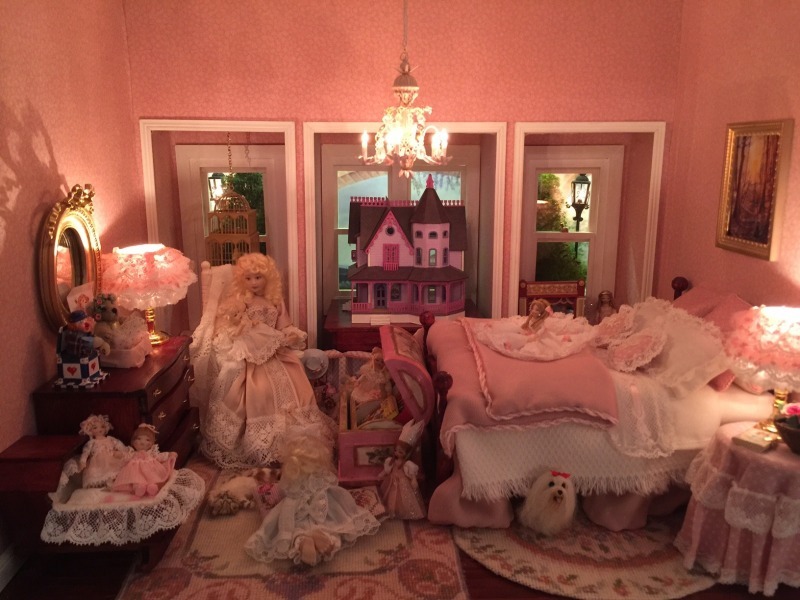 When I ran a competition during this past summer to see who had the most beautiful doll’s house room, Cinzia, who lives in Italy, sent me this picture of a really pretty boudoir. 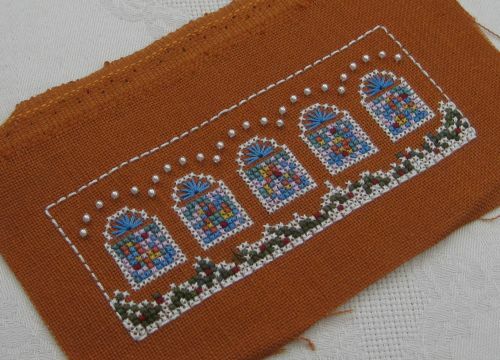 I was so impressed, that Cinzia eventually became a runner-up in the competition, which asked for images containing at least four pieces of miniature needlepoint, stitched from my designs. My doll’s house needlepoint customers never cease to amaze me. Cinzia has created this fantastic room herself, and made all of the needlepoint items from miniature needlepoint kits of mine. 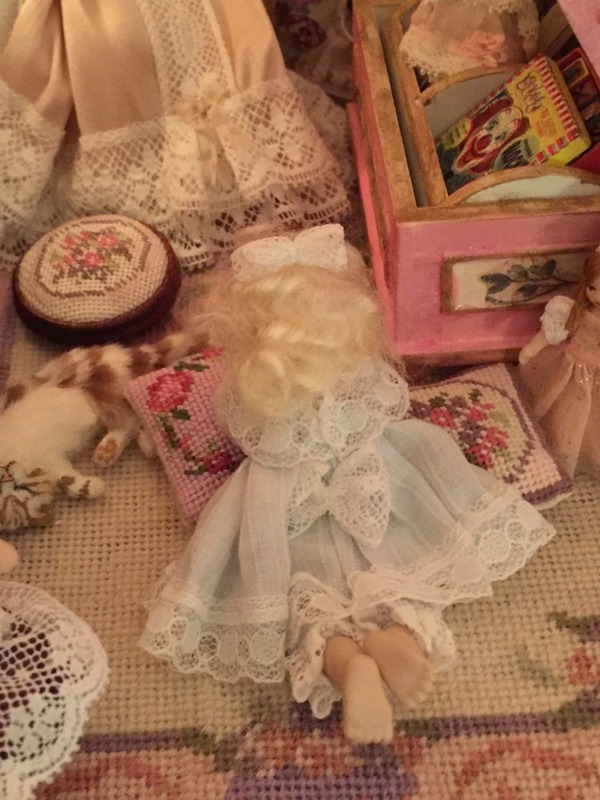 Here’s a close-up of the little girl doll, lying on a ‘Lilian (pink)‘ Aubusson style carpet, along with a round ‘Lilian’ footstool, and surrounded by little cushions that are only 1 1/4 inches square, in real life (available as kits here). I adore the cat lying next to her, doing what cats do! I don’t know what breed of dog this is (Shih tzu? ), but he’s very cute! I’m sure he isn’t supposed to be under the bed, anyway. There are dozens more inspirational pictures like these on my website in the Customers’ Stitching section. Wonderful inspiration for those of you looking for ideas for your next mini-project, but also a good way to while away a few minutes when you fancy some mini-sized eye-candy. 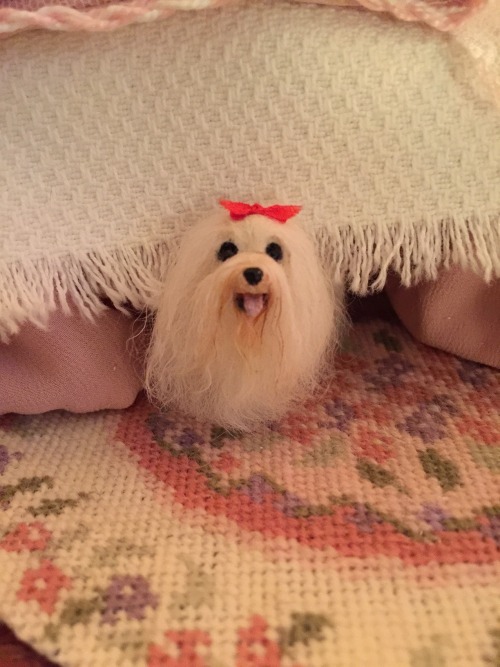 Author Janet GrangerPosted on November 21, 2016 Categories Customers' stitchingTags Doll's house, Doll's house embroidery, Dollhouse, Embroidery, Needlepoint1 Comment on Competition finalist: a ‘pretty in pink’ boudoir! Competition winner! 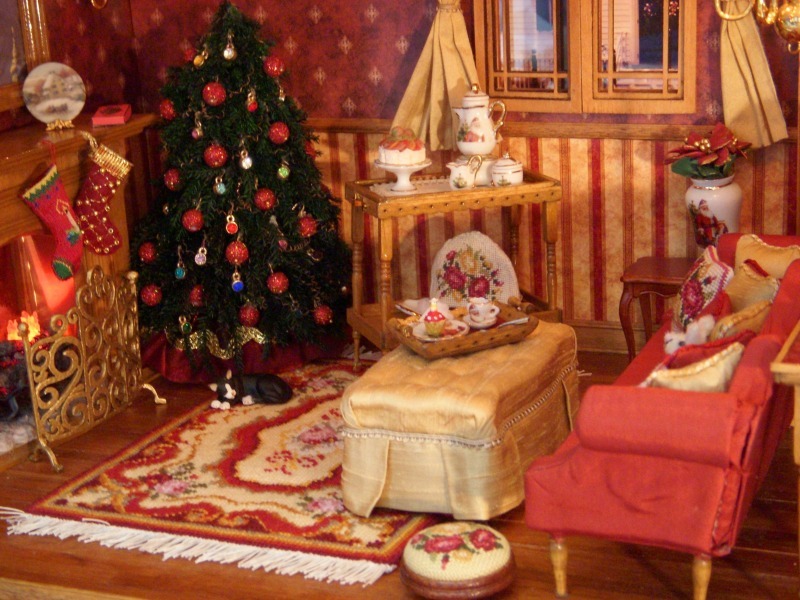 This is the most beautiful doll’s house room! This is the winning picture in my competition to find who has the most beautiful doll’s house! The room has been created by Debs W., who lives in Gosforth, in the North-East of England. 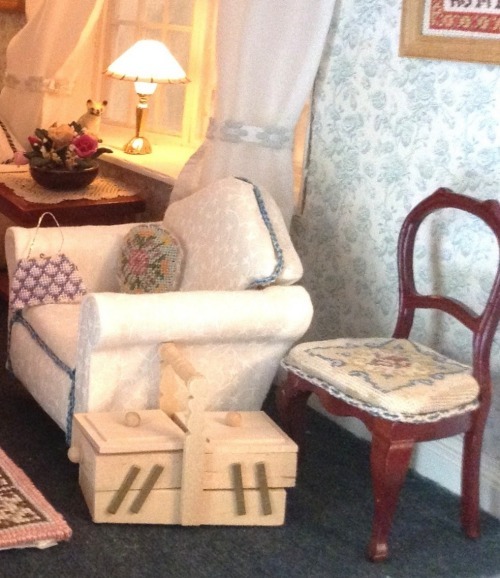 It’s a fantastic room, full of wonderful miniature needlepoint, stitched to a very high standard. From the left hand side at the back, you can see some ‘Summer Roses’ cushions and an ‘Elizabeth’ one on the sofa, an ‘Elizabeth’ footstool, an ‘Alice green’ firescreen, a ‘Barbara (small, green)’ carpet, a ‘Spring flowers’ pole screen, and then another ‘Summer Roses’ cushion on the armchair. 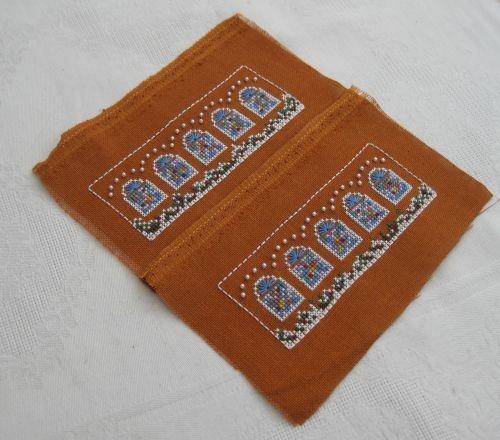 On the walls are two samplers – the ‘Peacock’ one at the rear, and the ‘Cat’ one towards the front. In the foreground from the left there is an ‘Isobel’ carpet, a ‘Summer Roses’ tray cloth on the tray on the table, a ‘Shell pink’ handbag and a round ‘Elizabeth’ cushion (originally square!) on the foreground armchair, and a ‘Judith’ dining chair on the far right. Finally, right at the front is a ‘Strawberry Thief’ rectangular stool. Sixteen pieces in all! Debs has certainly spent many, many hours on this room. Just look at it! I love the way she has adapted some of the kits to make them unique – such as making the ‘Elizabeth’ cushion into a round one, from a square one. And she has added a little braided edging (which she also made herself) to the ‘Judith’ dining chair, too. When I was trying to decide who would be the competition winner, it was a really difficult choice, as there were so many good pictures to choose from. But I felt that the picture of Debs’ living room that she sent in to me was the best of all those I received. 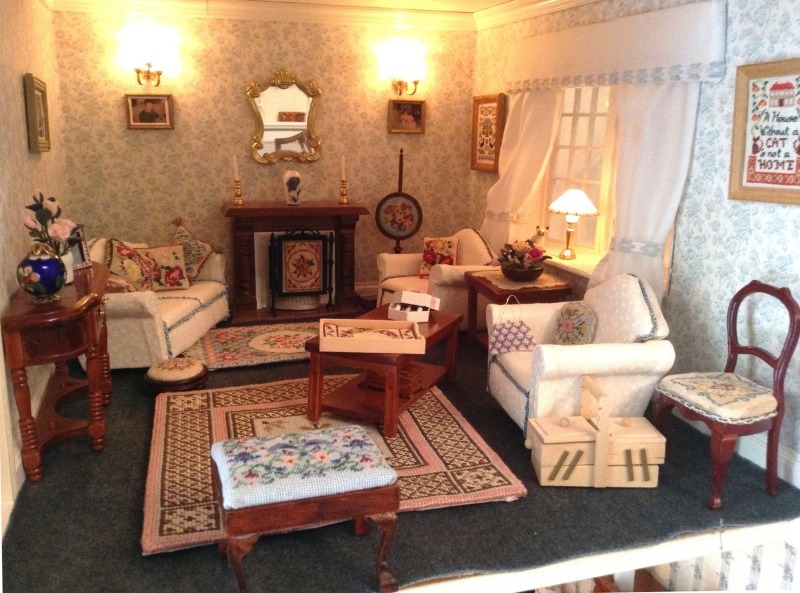 I loved the way she incorporated all the miniature needlepoint into the room to make it look so realistic. This is helped by the soft lighting, and the arrangement of the furniture. I also liked the way that Debs used items from all across the range of kits – not necessarily using a selection from just one co-ordinating group of kits. Debs’ prize is £200 in vouchers to spend on kits or charts from my website – so that should keep her busy for quite a while to come! I also awarded runner-up prizes to two other people, and I’ll be featuring their pictures in the next couple of blog posts, so keep an eye out for those…. Author Janet GrangerPosted on November 17, 2016 Categories Customers' stitchingTags Competition, Doll's house, Dollhouse, Embroidery, Needlepoint3 Comments on Competition winner! 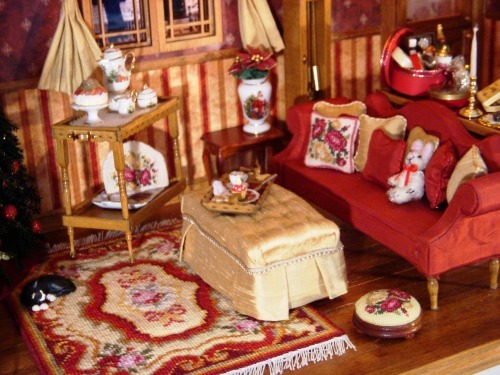 This is the most beautiful doll’s house room! 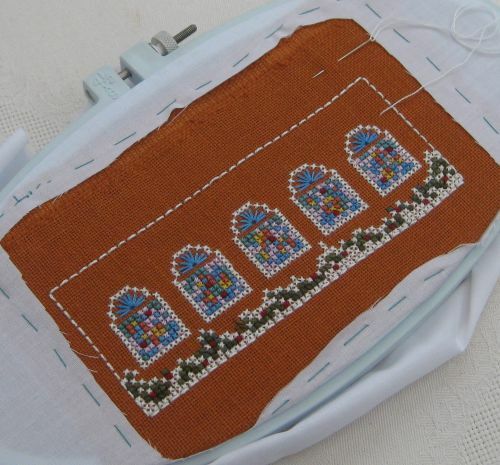 I’ve been stitching the long sides of the Gingerbread Church building this week. 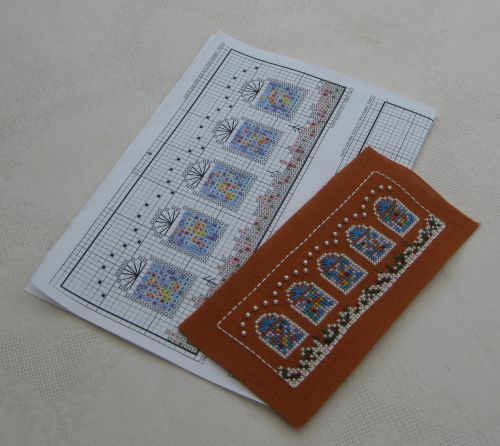 This is the charted design from Thea Dueck of Victoria Sampler in Canada – I am gradually working my way through all the buildings in this series. I cross stitched all the white first, then filled in with the bright colours for the stained glass windows, and lastly the grass and bushes at the bottom. The semi-circular blue areas over the windows are eyelets (well, half an eyelet!). Finally, little pearl beads are attached over each window. 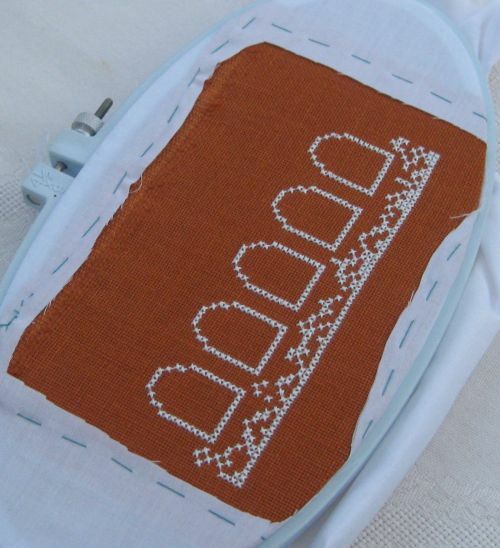 The window motifs for each side are different, so this doesn’t get boring to stitch. I loved doing this part, as the bright colours are lovely to look at, and the threads are silk, so they are very soft and easy to work with. When I’m working from one of the Victoria Sampler charts, I scan them in from the booklet and print them out at the original size. This is so that I can colour in the chart with coloured pencils – the paper in the booklets is too shiny to colour straight into the booklet, but also because I like to have each chart as a separate piece of paper, as it’s easier to attach to the clip on my tapestry stand. This is the coloured in chart for one of the long sides of the church. As I finish each section, it’s very satisfying to screw up the relevant chart and bin it – it makes me feel like I’m getting somewhere!